To introduce Art Plus Wallpaper Calendar Pro, we are offering a $29.95 SPECIAL LIMITED TIME OFFER for this version! Click here to order now! It's not just wallpaper... It's not just a calendar... It's BOTH! Use this program to display illustrated calendars on your desktop and display short notes or reminders directly on your desktop wallpaper. 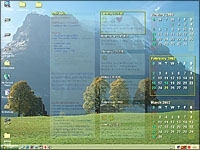 Wallpaper Calendar Pro comes with numerous predefined calendar layounts and built in diary.